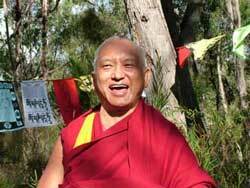 Rinpoche is currently leading the Mahamudra retreat hosted by Buddha House, Australia. This ends on May 4th. Rinpoche will be in Mongolia to host and teach during the EEC4, May 26 – June 23rd. As you know, Rinpoche would like many students to attend EEC in order to get the benefit of Denma Locho and Choden Rinpoche’s teachings and transmissions and to inspire the Mongolians to re-visit their Buddhist heritage. Rinpoche visits Korea to give his first talk there on July 4th. Then Rinpoche will teach and give Great Medicine Buddha initiation at Maitreya Instituut, Amsterdam, then move to Maitreya Insituut, Emst for CPMT 2004, August 24 – 29th, and will give 21 Tara initiation during CPMT. The official long life puja on behalf of FPMT will be offered to Rinpoche on August 30th. ‘We arrived late last night, missed our connection in Sydney, partly due to our flight being late leaving Auckland, and then in Sydney we got held up by customs. I declared all our usual variety of things – dirt from Mt. Kailash, horse hair, pills etc. they were very nice about it but wanted to gamma ray everything. Then one customs agent really got into Rinpoche and said “she would love to put Rinpoche through the x-ray machine!” She started asking all about Dharma and made a money offering – very nice, but it took so long, so we missed the flight. Then the customs agent insisted on escorting Rinpoche to the airlines, wanting to know more about Dharma….and taking time…..then other people were there to meet us and had questions….meanwhile the airlines couldn’t get us seats as everything was so booked being Easter. Then I had to pay for the stuff we had to put into quarantine and the cashier had left…..
‘I am in Tahiti…..you know the place that people think is a pure land, well it is a strange pure land but I can’t say differently to Westerners. If they experienced a REAL pure land – WOW! No comparison No comparison! In fact then Tahiti would look extremely sad, so pathetic! This is an excerpt from a letter which Rinpoche wrote to help the Great Stupa of Universal Compassion (in Bendigo, Australia) fundraise. Any FPMT Center or study group is welcome to use excerpts from this for their own fundraising material. (The full version will soon be available for use as a basis for fundraising in the Affiliates Area of the FPMT website). ‘By building a stupa or statue then every day, without words, you are continually liberating so many sentient beings – anybody that sees, touches, remembers, talks about or dreams of the stupa, etc. The stupa is meaningful to behold and liberates so many sentient beings everyday. If wind or rain touches the stupa, especially if the stupa has the four dharmakaya relic mantras inside, it becomes blessed and then wherever it goes, and any being that it touches, it will liberate them from the lower realms by purifying their negative karma. As many animals cannot hear mantras, all they have to do to liberate themselves is to circumambulate a holy object, even without the motivation. And just by seeing, hearing, touching or thinking about any holy object containing the four dharmakaya relic mantras, one can be liberated from all negative karma and sufferings. In the retreat house in Washington, Buddha Amitabha Pure Land, we have many insects inside the house. Every day we catch as many as possible in large jars with holes in the lids, so that they have ventilation and room, and circumambulate a large altar full of holy objects – relics, photos and images of buddhas, tsa tsas, and stupas (filled with the four dharmakaya relic mantras) – running as fast as possible, to do as many circumambulations as we can, with the jars full of insects. Then we release them outside. It is so incredible how fast this will purify them. Their lives now will only get better and better. When you take insects around holy objects, it directs their lives towards enlightenment. So as we circumambulate with them, we will give them all the body of a happy transmigrator in the next life, a happy rebirth. Not only that but we give them the opportunity to practice Dharma in their next life, which is the most important thing, to have a better rebirth to be able to accomplish the path, cease the defilements and achieve enlightenment. This is an incredible gift to them from us, it repays the kindness to them, since they have been our mothers’ numberless times, and because of their kindness we have been able to practice Dharma. Because of these reasons I asked for a stupa to be built at my house in California, Kachoe Dechen Ling. It is an extremely beautiful stupa filled and covered with many tsa tsas and the four dharmakaya relic mantras. The idea to build the stupa came because Ven. Roger wanted to have a dog. We got a dog from somebody who could no longer keep her, and called her Om Mani Padme Hum. If you have pet it is very good to give it a Dharma name rather than giving it a useless name that has no benefit for the animal. If you give your pet a Dharma name such as the names of the path to enlightenment (renunciation, bodhichitta, and emptiness – they can be in English, Tibetan or Sanskrit) this leaves a positive imprint on the mind of the animal. Each time when Om Mani Padme Hum hears her name, it plants the seed for the whole path to enlightenment and leaves a positive imprint on her mind. It also creates the cause for her to understand all the 84,000 teachings of Buddha because they are contained in Om Mani Padme Hum – the two truths, the path; method and wisdom, and the goal; dharmakaya and rupakaya. It leaves a positive imprint for her to be able to hear all the Sutra and Tantra teachings, the extensive teachings of Buddha, each time we call her name. So that is incredible. Each time she hears her name it definitely brings her closer to enlightenment. So this is such an easy way to benefit animals and to bring them closer to enlightenment. We must attempt to benefit them in every single way. We must do it for others to quickly liberate them from samsara, which is only in the nature of suffering and which is continuous. Things that you can easily do for your pets is to take them around holy objects; read lam-rim prayers, which contain the whole path, or the Heart Sutra, Diamond Cutter Sutra, the Sutra of Golden Light, the Arya Sangatasutra and to chant powerful mantras as much as possible. There are so many practices that you can recite next to them as well as many other things that you can do, but if you can’t do these then an easy one is giving them a Dharma name. The stupa built at Kachoe Dechen Ling was mainly for Om Mani Padme Hum. I thought that if we have a dog then we need a stupa so that the dog can circumambulate it everyday. And now we have the stupa we also have three to four animal liberation practices each month (on the Tibetan 8th, 15th and 30th and on all Wheel-turning Days). We buy worms, insects, etc., and circumambulate them around the stupa as many times as possible, then we chant mantras and blow on water, which we sprinkle on them, and then we liberate the animals. If you have one thousand insects and worms in bags and if you circumambulate them around the stupa three times, not only will you liberate them from the lower realms, they will also create the cause of enlightenment. So each time you circumambulate them you are giving all those thousands of insects and worms enlightenment, liberation and a good rebirth. Also as many stupas that there are, and if each contains many of the four dharmakaya relic mantras, so however many numbers of the mantras, so with each circumambulation you are giving the animals that many numbers of causes of enlightenment, liberation from samsara, happiness of future lives, and you are creating the cause for their unbelievably, unbelievably, unbelievable purification and for them to collect merit and, by the way, no question also for yourself.